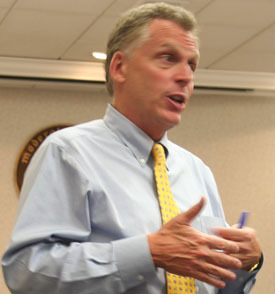 A new poll from Public Policy Polling has Democrat Terry McAuliffe opening a small lead over Republican Ken Cuccinelli. But before McAuliffe gets too fat and happy with the five-point lead that he has, according to PPP, there’s this news – it’s more that he’s viewed as the lesser of two evils than a sign of love from Virginia voters. Both McAuliffe and Cuccinelli are underwater in terms of favorability – with McAuliffe at 29 percent favorable/33 percent unfavorable, and Cuccinelli at 32 percent favorable/44 percent unfavorable, according to the PPP poll. The numbers for Cuccinelli are even more negative among independent voters, who split 25 percent favorable/51 percent unfavorable for the Republican. McAuliffe leads Cuccinelli among independents by a 39 percent-28 percent margin.